We recently redid Penny's bedroom for her birthday - it was the last room in the house that we hadn't painted since we moved in two years ago. Her room got a fresh coat of soft yellow paint on the walls, and white on the bead board below the chair-rail, and we put this fun pink in the closet. She has a wide closet with accordion doors that stay open all the time, so her closet really is part of her room. Because of the doors, there is some awkward space on either side of the closet that is sort of blocked off by the doors and not very accessible. After trying lots of drawer/shelves ideas in there, we decided to try installing four sets of shelf brackets, and setting big plastic bins on top of them for all her pajamas and socks and pants. I can grab a bin and set it on her bed to sort through the whole thing, or I can just grab whatever I need from where it is. They have worked out really well - they use space that would have otherwise been wasted, they were super-inexpensive, and they stay relatively well organized. Yep, I'm veering away from creative endeavors today to talk about something else that comes with being a momma - weight gain. I ran into an old friend recently, and while I was hugging her, I was trying to calculate in my head how many more pounds I'm carrying around now than the last time I saw her. After Baby Number Three, the pounds haven't exactly melted off. They could more accurately be described as not-going-anywhere. Today, I weigh exactly 52 pounds more than I weighed on my wedding day. That's significant. My closet is like an archaeological dig. There are clothes from pre-babies: my professional teaching wardrobe of dress pants, dry-clean-only blouses, and suits in smallish sizes that I will never wear again but cannot bear to part with. There are maternity clothes from all three trimesters, spanning three pregnancies and reflecting trends from cargo capris to maxidresses. There are my Big Girl clothes from post-pregnancy. There are my in-shape clothes from post-baby-number-one, when the gym was my refuge and I spent every morning among like-minded stay-at-home-moms in our weight-lifting-lite classes, Zumba, and hours on the elliptical. There are my Even Bigger Girl clothes from the past eight months. My closet is chock-full of clothes, and about 7% of it fits. And sometimes that's pretty depressing. Sometimes I feel really bad about how different I look and feel now than I did four years ago. Sometimes I'll catch a glimpse of myself in a mirror and not even recognize this body. Not gonna lie, sometimes it's hard. But that's sometimes. Most of the time, I have a little more perspective on this whole weight-body-shape situation. Most of the time, I recognize that what I've been through - three pregnancies and deliveries, nursing for a total of 40 months and counting - represents plenty of accomplishment to warrant some grace for my less-than-ideal shape. Most of the time, I appreciate that this is temporary. One of the most freeing things I've ever heard is that maybe all the descriptions of the Proverbs 31 woman aren't supposed to be a snapshot of one day - maybe they're supposed to be a list of accomplishments from her whole life. Sure, we can be great moms. We can have successful jobs. We can work out and be in shape. We can be involved in our churches and in our kids' schools. But not all at the same time! "To everything, there is a season." And right now, my season involves lots of diaper changes, nursing, naptimes, laundry, discipline, messes, and snuggling. And my less-than-ideal body is perfectly capable of doing all that work - the work that God has given me for this season of life. And this season is just that, a season. And I can choose to embrace it, or I can look forward to the next season when I can potentially spend more time exercising, and diet without it messing up nursing, and miss out on this season. Or I can try to force too much into this season and not be successful at or present for any of it. I had to take a survey at my gym one time, and one of the questions was something like, "Do you feel empowered by how capable your body is now that you're working out?" I thought long and hard about that one. I feel empowered that my body can grow and protect a baby through a whole pregnancy. I feel empowered that my body can give birth to those babies. I feel empowered that my body can provide nutrition and comfort to those babies for months and months after they are born. I feel empowered that my body can hold and care for those babies. The fact that I can also lift heavier weights that I could three months ago? Meh - not that impressive to me. Hopefully, in the next season, I'll drop some pounds. Hopefully, I'll be able to wear more than 7% of the clothes in my closet. Hopefully, I'll be able to wear that slinky dress that my husband loves. But until the next season, I won't. Instead, I'll focus on my body doing the work that God has given me. And it'll be okay. I've finished some Pinterest-inspired projects lately. Which is a good thing. My projects-pinned to projects-actually-attempted ratio is not good. I've been meaning to make a summery wreath for a while now - what was on the front door had pine cones and berries on it - not the best look when it's 107 degrees outside. So I finally got around to doing a new one. Those kids will not let me take a picture without them! They're like moths on a flame when a camera comes out. My original idea when I saw these blue flowers was to do a red-white-and-blue wreath. Then I got home from Hobby Lobby with all my supplies and realized that all the flowers in our front yard are pink - I just couldn't do red next to that. New plan: blue flowers, white trim that I bought years ago for a sweater that I've given up on embellishing, raffia, and little cream flowers that I made out of felt. To make the flowers, all you do is cut the felt in curlicue circles, then cut a scallop all along the outside edge. Starting with the outside, roll the felt up and hot glue the base. One project down! On to the next one. . . I chopped the end off a sturdy box, hot glued on home dec fabric, and parked it in the kitchen. It's the perfect size for our family calendar, plus my MOPS notebook, our Bible study book (we're doing Panorama - if you're in NWA, check it out! It's amazing! ), and my pad of lists, without which I would be lost. Seriously, I would wander around the house and have no idea where I was supposed to be and what I was supposed to be doing. Pinterest project number two, checked off the list! It's Pinterest-inspired in that you can't throw a rock on Pinterest without hitting a banner of some kind. Though I wouldn't recommend throwing rocks on Pinterest. Lots of breakables there. So Penny and I cut out three navy cardstock triangles and six white triangles. She used my star punch to do the white stars, and she also cut out strips of red, which we glued on and trimmed the excess off the edges. I attached them with kite string through grommets at the top edges - I wanted it to be more sturdy than the last pennant we made, where we just taped the string to the back of the triangles. That one kind of fell apart. Looks very festive on the pergola in the backyard, right? Alright, Pinterest, that's 21 pins down, 1070 to go. . . Here are a couple of projects from Summer Vacation this week! For the fingerprint trees, I chopped cardstock into squares an stamped tree trunks - then passed out my stamp pads to the kids to get creative in using their fingers to make leaves. I used a stamp from Oriental Trading Company (LOVE their clear stamps! ), but it would be pretty easy to just draw a tree trunk and limbs with a marker. Another cute fingerprint project I've seen recently is birds on a wire - from Mrs. Weber's Art Class. And, here are a couple of my precious kiddos. It was just the friendly reminder I needed today. I knew that I couldn't handle something that I would have to clean up today during our Summer Vacation special activity/craft time. So I ran to check out my Kid Activities file on Pinterest (seriously, if you haven't fallen into the addiction that is Pinterest, it's time to join). I found a picture from The Weekend Homemaker of a balloon and two paper plates glued to tongue depressors. So out come the balloons and paper plates. I couldn't even get it together enough to glue on the sticks. We called it Balloon Ping Pong. And the kids loved it. Penny liked the try-to-keep-two-balloons-in-the-air game, and Camden was just giddy about something that he was allowed to hit as hard as he could. Poor boy, most of his favorite activities are forbidden in this house: hitting, spitting, kicking, shrieking, pulling hair. . .
Fortunately, we fully support his habit of not wearing pants. At least he has that. It's a fabric balloon cover that you stick a deflated balloon in and blow it up. Penny has had one for years and she loves it. They're only $8. They'd make a great special summer surprise. Happy Day 8 of Summer Vacation! Sheesh! The girl's gonna have to wear that costume until she turns 20. Sorry, kiddo, you're not allowed to grow yet. You haven't gotten full use out of your Rapunzel dress. 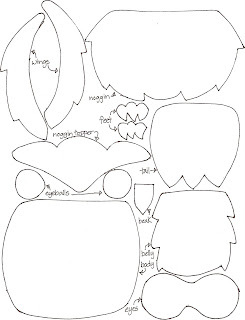 You can either print it directly onto the cardstock or patterned paper that you're going to use for the owls, or print it out and cut out the pieces to use as a template. I used all scrap paper for mine, but it would be easier to use big pieces and just print on them. I used three different patterned papers per owl. One was the head, wings, and tail; one was the body and eyes, and one was the belly and brow (or noggin topper, if you wanna get technical about owl anatomy). The eyeballs were cut out of white cardstock, the feet and beak were orange cardstock, and I just used a hole punch to get small black circles out of cardstock for the centers of their eyes. * You can print the template on the front of the paper and have a black outline when you cut it out, or print it on the back. This guy's pretty reversible. 3. 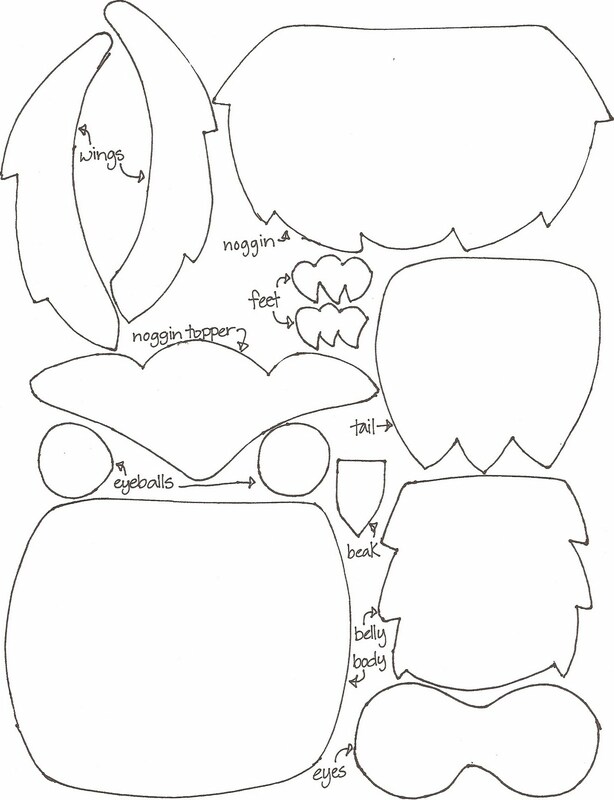 Cut out all the owl parts & lay them out how you want them. Now, at this point you could get really creative with inking edges, and stamping, and embossing, and glitter and sequins and paint. . . I didn't. But feel free to go nuts. Here is my army of owl minions. 4. Cut the top of the paper bag into a triangle and fold it down, so when it's closed the top is a little V.
Glue the noggin topper on top of the folded-down part. (But be careful to not glue the bag closed.) Hold the top of the bag folded down so you can place the rest of the owl according to where the top of his head is. 5. Put glue on the top of the head and glue it to the front of the bag, under the folded down top. Then glue the tail at the bottom of the bag, and the body overlapping the tail and under the head. Add the wings and tummy, on top of the body and under the head. Add all the eye parts and the beak. Glue that across the bottom of the body, over the tail and under the wings. Then glue the feet over the top of the cardstock strip so it looks like the owl is perched on top of it. 6. Fill with goodies and staple the top shut! That's it! Okay, if you don't want to put a staple through the owl's head, you could also punch two holes and thread some ribbon through the top and tie it like a bow. That would really girl these up. Or you could just not overthink the staple. These were perfect for a classroom party goody bag - festive enough for the kids to be excited to get them, and small enough to hold just a few treats. They would work well as party favors, too, if you're having an owl-themed party. Or any fall-themed thank-yous that need to go in a bag. Or for taking some pumpkin bread to a neighbor. Yum. Happy Halloween, everybody. Today is a special anniversary for me - three years ago I signed up on Etsy. Can't believe it's been three years! I'm feeling especially blessed today to be a stay-at-home working mom.